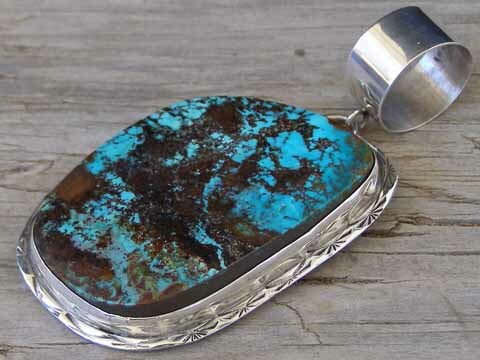 Navajo silversmith Juan Guerro made this over-sized pendant set with a large, free-form stone of natural, untreated Pilot Mountain turquoise from Nevada. This is "saw rock" which is sawed into slabs in extracting it, then a grinder is employed to remove the host rock which conceals the layer of turquoise deposit. Because of the way that the turquoise deposit forms (in a layer between two layers of host rock), the resultant cut stone is usually flat, or near flat on the surface like this stone. The stampwork decoration of this pendant is simple and the real value in this piece is the over-sized, gorgeous stone of Pilot Mountain turquoise. Hallmarked "Juan Guerro" and stamped "Sterling on back. Stone: 1 13/16" x 1 1/4"
Size of pendant (excluding bale & jump ring): 2 1/8" x 1 1/2"